This is number seven in The Country Club Murders and, like the ones that came before, is fast, fun, and fresh. Ellison Russell, a woman who seems to stumble over a dead body constantly, is sitting with her friend Libba at a psychic’s home. Not wanting to be there, Ellison isn’t happy when the odd ball with the crystal ball talks about her dead husband Harry, and how he wants Ellison to know that she’ll be coming across a new dead body very soon. Leaving Madame Reyna’s behind, Ellison hops in her car to go home only to “thump” into a pedestrian who suddenly walks out into the road. It is a fifteen-year-old girl who, thankfully, has not been hurt but also does not want Ellison to call the cops, an ambulance, or even take her home. What she does do is give the kid her coat because it’s cold and provides her with her name and address. When a police officer shows up on Ellison’s doorstep the very next day and tells her that her coat was found wrapped around a dead girl, it seems Harry’s words have come true. Ellison cares deeply for Detective Anarchy Jones but has broken up with him. But with this dead body (and more coming) she and Anarchy are thrust back into each other’s lives. Add to this a stripper by the name of Starry; a next door neighbor who wants to strangle Ellison for letting her dog destroy her home; and Ellison’s own mother who has found a dead body in her hall closet and doesn’t know who it is or where they came from, and you have a mystery that will have your heart pounding and bring a smile to your face throughout. These characters are a whole lot of fun to be around; the banter, the wit, that wonderful dog—they all come together to make this one of the most enjoyable series being written today. 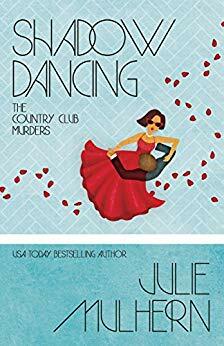 Be the first to comment on "“Shadow Dancing” by Julie Mulhern"